How would you like to touch and play with a dolphin? 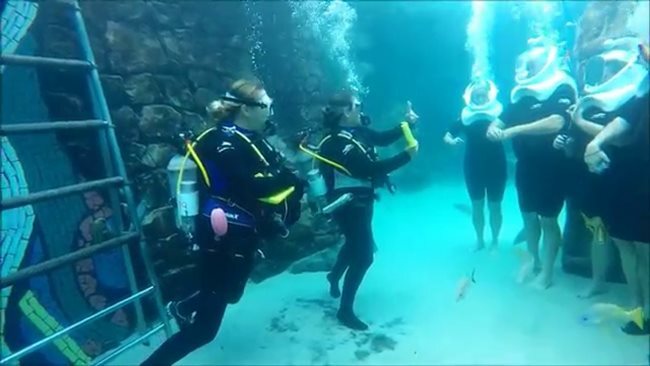 To dive underwater without SCUBA training? Florida has great natural beauty and wildlife, and it also has great convenience in attractions like Disney World. 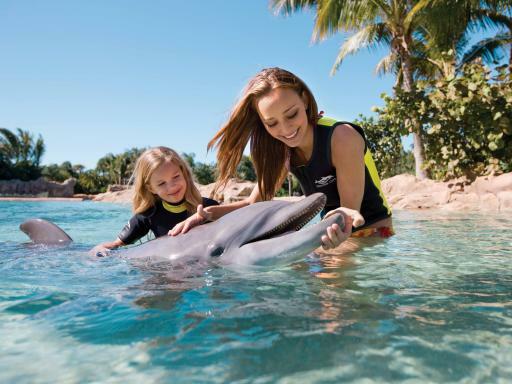 Discovery Cove combines the two, bringing you unique, bucket list experiences in a way that is pure comfort. They even have wheelchairs with dune buggy style wide tires for the sand. The attraction is artificial, but upscale, and contains enough nature. You can spend the day just taking a towel and bathing on the beach in hammocks or lounge chairs, swimming in their “reef”, or floating the lazy river. But that’s not why you attend. Get the dolphin swim package, which varies from $230 to $340 depending on the day of the week and the weather, and expect to pay as much as $200+ for your group’s photos and video. On top of that, you really should upgrade to swimming with sharks, the sea dive (SeaVenture), or feeding manta rays. So you’re looking at as much as $1,000 for a couple, but there are no other hidden costs once you’re in. Once you’re on site, drinks and food are free, including alcohol. Food is served cafeteria style, including a pulled pork sandwich, wraps, salads, fresh fruit, rice, vegetables, chicken tenders, and it’s easy to get something healthy, or to snack on chocolate chip cookies all day. You can arrive as early at 7:15am and stay to 5pm. The resort is open year-round, but during cold weather, you’re required to wear a wet suit. Don’t worry about the cold, because the dolphin swim is heated to 77 and the lazy river heated to 88. Lockers and showers are convenient, and the staff are friendly and you’ll find plenty of them. On the lazy river, take a flotation device and just allow the circular river to push you around. It’s romantic for couples and fun for families. Unlike at water parks I’ve been to, the lazy river had a number of weird occlusions and rocks. I stubbed my toe more than once, and the flow of the river sometimes pushed us into obstructions instead of straight ahead, but at a slow pace. Along the way you can stop to watch a handler with marmosets, or visit an aviary, where birds will sometimes land on you. Watch your step for bird droppings! The central event is swimming with a dolphin, which you do in small groups of a dozen or so people. Dolphins are top predators, but apparently safe for you to pet them, kiss them on the beak, and even grab on and get pulled on a ride. The trainers expertly answered all our curious questions, and it seemed they really cared about the dolphins. So we heard, the dolphins would not participate if they didn’t want to, but apparently they do. Dolphins are smooth and strong, like hard rubber. It was awe-inspiring to interact with them. It wasn’t quite life changing, but the most notable experience we had in Orlando, a vacation city known for its larger-than-life attractions. The SeaVenture was worth seeing, but had an unfortunate problem. The square siding to the helmets meant that as we turned our heads, the angle of refraction of light changed. Think about a straw in a glass of water, how it appears to bend funny, because you see it differently through water than through air. Looking around we lost our sense of exactly where we were in relation to the fish, to each other, and even to our own limbs. I felt disconnected from the experience, a step remote from it. That made it a worthwhile but not perfect experience. If you’re on a budget, the place for you is Gatorland (see my review, 5 stars!) 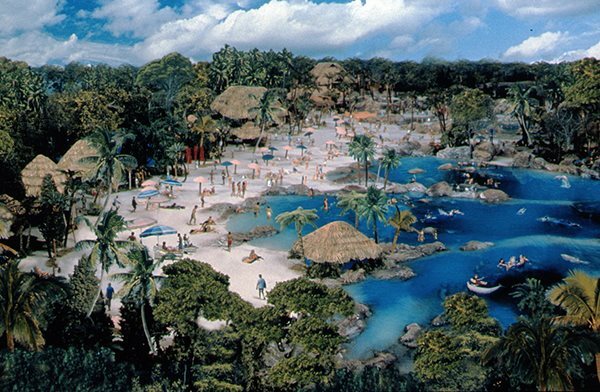 but if you can afford it, Discovery Cove is the best wildlife in Orlando you can get without leaving curated, paved pathways. They also hold night functions, corporate parties, and weddings. It’s an easy 5 stars plus, a rare and the highest rating I’ll give. Read all 11 of my Orlando reviews and suggestions, and see www.discoverycove.com.